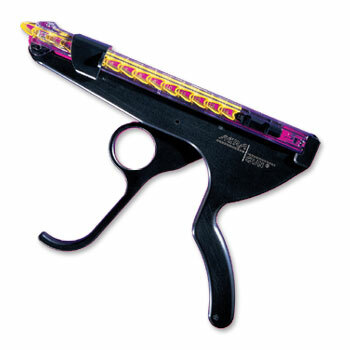 CRA-CUT has developed a clip gun system that fulfills the promise of fast, trouble-free application of scalp clips. Its unique design prevents accidental clip ejection or failures to feed. The result makes the opening procedure faster and easier. Fits comfortably in any size hand. Applies clips quickly at any angle, even upside down, with complete control. Has only four moving parts for maximum reliability. Combines the economy of a reusable gun with the convenience of sterile, preloaded cartridges. Cartridges snap and lock into the gun quickly and easily. Integral cartridge lock eliminates uncontrolled clip ejection. ACRACLIPs are available with serrated or straight jaws in a choice of three clamping forces.